A reader/editor wrote, “When I read the first chapter I got out of bed and made sure all of my windows and doors were locked. I was scared to death.” Everyone will find something to cheer about in this book; except criminals. This is a fast paced adventure story whose heroes have to fight for their lives. In 2025 A.D. “The Law” is passed as The Endangered Human Species Act. 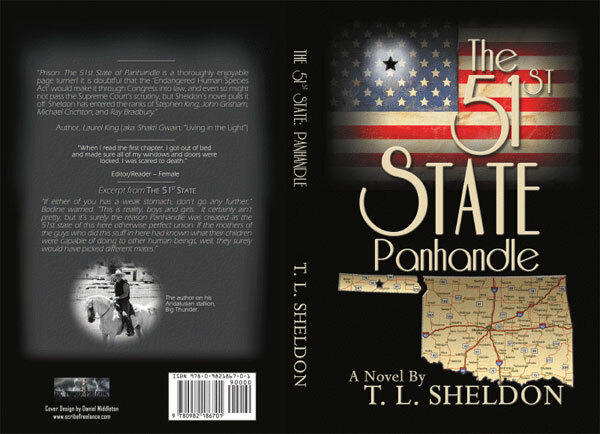 It annexes the Oklahoma Panhandle as the 51st State of the USA. New standards are set in The Law so that American society can breed a “gentler and kinder” society. In 2040 A.D. ex-DA Michael Lafitte is unjustly sent to Sector One of Panhandle, the new name for prison. It is the sector reserved for the worst that society has to offer. Riding his mare, Bordeaux, Michael’s father, Kirk, goes in to extricate him and his Andalusian stallion. It’s not an easy journey for all the off beat characters and dangers they encounter. What’s worse is that Kirk’s heart has transplant value. After reading this book you’ll carefully consider who should be parenting children.